This is one of the most exciting videos I’ve seen about Oculus Rift, and it’s a Technology.ie exclusive! 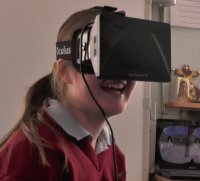 MissionV is a virtual reality platform for teaching and training which is currently beta-testing in 11 Irish schools. Recently, its founder James Corbett brought me to visit one of those schools: St Kieran’s NS in Broughal, Co Offaly. The kids there are expert users of MissionV, which uses OpenSimulator, the open source version of Linden Labs Second Life, running on a secure closed server, with access fully controlled by their teacher. Normally they use a desktop client, keyboard and mouse to build and explore their virtual world, but today James has brought something different: the Oculus Rift VR headset. Virtual Reality is cool – sure! And Oculus has generated a lot of speculation since its acquisition by Facebook last month. 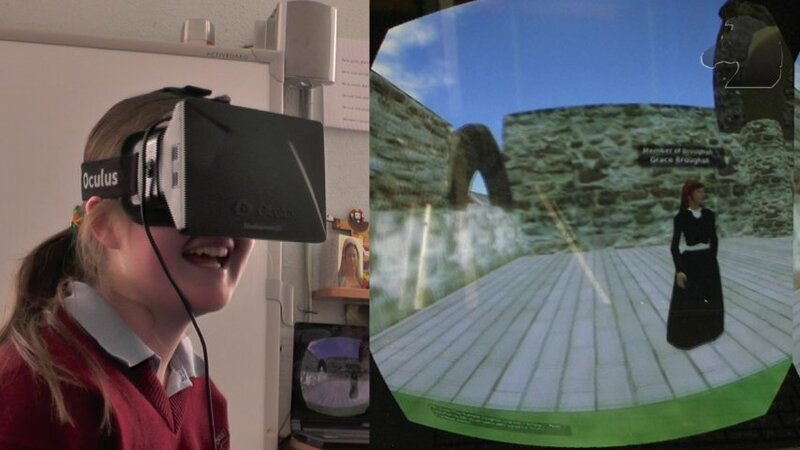 But what’s really cool is that these 10 – 12 year olds learned 3D modelling and scripting, raided the web for textures and images, and recreated a historic site after a field-trip to Clonmacnoise. Somebody finds a solution to a problem, and then they tell everybody else. MissionV will open for all schools from September 2014. Technology.ie is tech media from Ireland, brought to you by Blacknight, Ireland’s leading provider of domains and hosting.